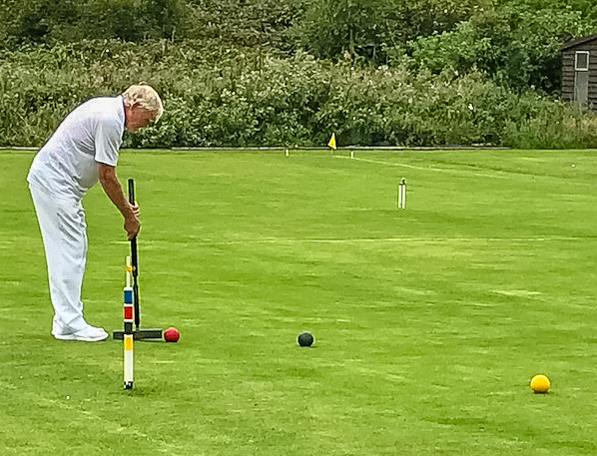 Seven north west croquet clubs were represented (sometimes by more than one member) at a Club Development Workshop on 12 January 2019, led by the CA National Development Officer, Dave Gunn. The event was hosted by Bury Croquet Club at their Whitehead Park clubhouse. The idea of the tool is that it asks questions about many existing aspects of your club, together with your aspirations. At the end the tool summarises your answers, provides a plan of action and produces further links to other tools and media for you to consider using. It was extremely worthwhile and thought provoking. Many clubs seemed to get ideas from it. One criticism is the tool is designed for any Sports club and available nationally, so is trying to be one size and fit all. It becomes quite obvious some questions are irrelevant to your particular club but these can be skipped with a N/A button. Even having seven Croquet clubs in the same room highlighted this problem. Each club having their different number of members, strength, resources, etc. There were early, and sometime heated, debates between the attendees. Time ran a bit short, this probably would not happen in the usual one club workshop format. 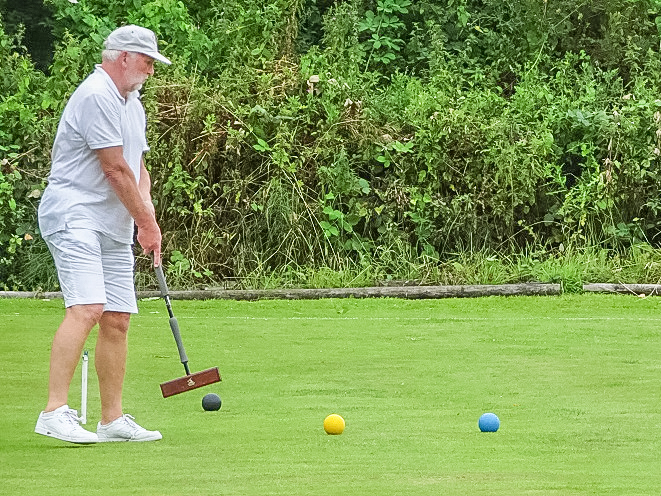 For any club wishing to have a look for themselves, Dave suggests that they visit his page on the CA website (https://www.croquet.org.uk/?p=clubs/croquetmatters) to find out a little more about the programme and then either contact him directly (07710 981 561) or alternatively approach the new Federation Development Officer Sarah Andrew, either of whom would be delighted to facilitate a dedicated club development workshop. Bury provided a wonderful lunch, and there was much to talk about during that time. Thanks must be given to Dave for presenting it, Bury CC for hosting it and the Federation for the idea of holding it. 2 The link to his section on the CA website is https://www.croquet.org.uk/?p=clubs/croquetmatters. If you then click through to Marketing section, there are details re the club website template offering (including example clubs and also the online helpdesk where you can register interest or ask questions) and also a link to download the ‘How to get your club on to Facebook’ guide. 3 You can download the Blank Club Improvement Plan Questions here. 4 You can download The Guide to ‘Croquet Matters’ here – this is for use by FDOs and other Fed Committee Members when supporting clubs…but can also be very useful for clubs themselves following them having experienced their own dedicated workshop or, possibly, having seen the ‘general taster’ at the workshop & then decide to plough on themselves. 5 The link for the lead contact at each club to register as an individual on the Club Matters website is https://learn.sportenglandclubmatters.com/login/index.php. They can then add their club as ‘a new club’. 6 Any other club committee members and even general members can register using the same link and then search for their club on the system and ‘join it’ This will then allow all registered club members to see the various club development plans etc produced over time…. The format was a 5 round Swiss, full bisque base 10 time limit 3 hours. Day 1: A wonderful standard of play from everyone in easy conditions. Our lawns playing very well and beautifully prepared by Philip and Richard in the days leading up to the event. Several spectators and welcome helpers including our President and the NW Fed Chairman saw Helen Brophy take the overnight lead. 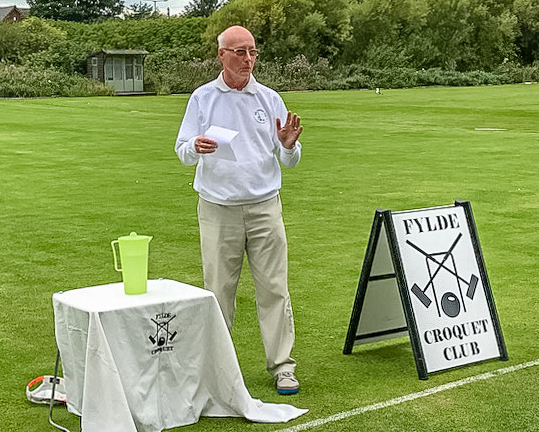 Followed by a strong group of defending holder Philip, Flyde’s Alan, John H who always shines here at Fylde and Adrian who has risen to handicap 6 in just three years. Take a point if you said “The Sun” but take two points if you said “Britney Spears” who switched on the Blackpool Illuminations for us. Day 2: The gentlemanly conduct and sportsmanship from yesterday continued as the competition intensified on another beautiful warm, still and dry day. With two places in the final up for grabs the places in the final were still quite open and would not be decided until the end of the final round after lunch. The fourth round results had the effect of concertinaing the field to a great extent making the results of almost every game in the final round crucial. Adrian Apps was playing solid Croquet and achieved his Silver Merit Award. In the final round Adrian, Alan and Phil were favourites. Adrian duplicated his round four Silver Award and was first to finish. But with only two places in the final should they all win their games the tie break rules would decide. He had a nervy hour or so before it became clear he was through to the final. Alan had a nail biting finish. With all four balls for the peg, a seven yard roquet was what he needed and did not get. Phil was last to finish as his opponent made a spirited effort to level the points with a time turn break in front of the pavilion with everyone spectating. A backward take off fell short of 2b and hands were shaken during applause.